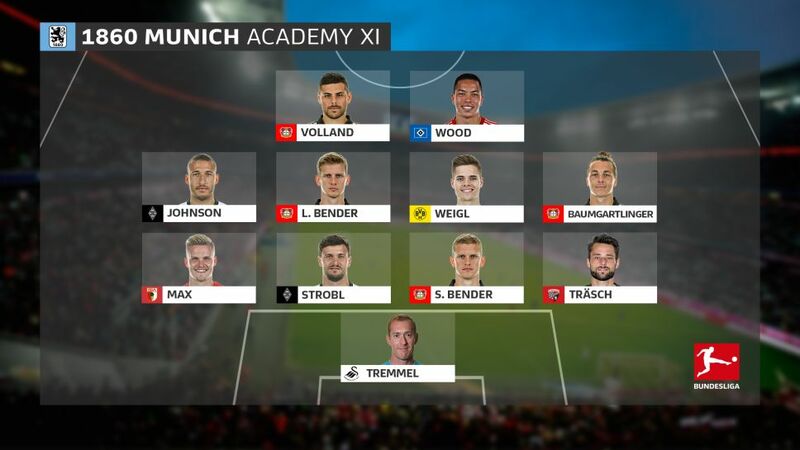 Bundesliga | 1860 Munich Academy Dream Team: Where are they now? 1860 Munich Academy Dream Team: Where are they now? The capital of Bavaria may be synonymous the world over as the home city of the all-conquering Bayern Munich, but in 1860, the Bundesliga giants face a rival that has been tough to beat in terms of producing footballing talent par excellence. Tremmel's move to Unterhaching in 1998 would later earn him a Bundesliga debut against the very team he had spent three years with as a youth player, 1860. A much-admired and respected journeyman, the 39-year-old recently hung up his gloves following spells at Hannover, Hertha Berlin, Energie Cottbus and FC Salzburg. A string of impressive UEFA Champions League performances for the latter club against the likes of Juventus and Manchester City earned the Bavarian a move to English Premier League side Swansea, where he lifted the League Cup at Wembley in 2013. Versatile defender Strobl could have chosen another sporting path - the youth golf champion showed plenty of promise with a putter in his hand early on. However, having embarked on a footballing career from as early as six, Strobl's immense determination to succeed in the world of football began to bear fruit when he joined 1860 in 2000. Later making his Bundesliga debut as a Hoffenheim player, the 27-year-old joined Cologne on loan before returning to Sinsheim where he racked up 86 league appearances. Strobl suffered an untimely ACL and meniscus injury prior to the start of his second season at latest club Borussia Mönchengladbach. Bender was Under-19 European champion with Germany while on the books at 1860, a tribute to his development at the Munich club from a young age. The twin brother of Lars Bender, Sven went on to feature prominently under Jürgen Klopp in Borussia Dortmund's back-to-back Bundesliga title-winning years of 2011 and 2012, the latter forming part of a league and DFB Cup double. A losing finalist in the 2013 UEFA Champions League final, Bender also claimed silver for Germany - for whom he won seven senior caps - at the 2016 Olympics. Another versatile defender/midfielder schooled at 1860, Träsch rose to feature for the club's second string team when Stuttgart came calling in 2007. A top-flight debut against Schalke arrived the following year and preceded UEFA Cup and UEFA Champions League experience. The interest of Wolfsburg was duly piqued and Träsch went on to complete six seasons in Lower Saxony, even captaining the Wolves - with whom he reached the Champions League quarter-finals in 2016 - on several occasions. Currently plies his trade at hometown side Ingolstadt. Now in his fourth season at Gladbach, full-back Johnson has enjoyed a varied career on the domestic and international fronts since taking his formative steps at 1860, passing through every youth category at the club. Remaining at the Bavarian side until 2009, the Munich-born Johnson opted for Wolfsburg but it was at subsequent club Hoffenheim that the USMNT star flourished, scoring five times in 87 Bundesliga appearances. A European U-21 champion with Germany, Johnson switched allegiances following a call from former U.S. coach Jürgen Klinsmann and later played at the 2014 FIFA World Cup for the Stars and Stripes. Bayer Leverkusen captain Lars Bender was once an 1860 fledging just like his twin Sven. Already featuring with the 1860 pros as a 17-year-old, Lars would go on to become the Munich side's youngest-ever captain two years later. Shortly before reaching the 2010 FIFA U-20 World Cup final, the defensive midfielder joined Leverkusen, where he has remained ever since, scoring 17 times in 192 top-flight games and finishing as a Bundesliga runner-up in 2011. Lars was also part of Germany's successful squad at the 2008 European U-19 Championship, scoring twice en route to glory. He featured at UEFA EURO 2012 but suffered an injury that prevented him from travelling to the 2014 World Cup. A native of Bavaria, Weigl's rapid progress at 1860 led to him captaining the U-19 side. A senior debut in the second division soon followed and it was unsurprising that a team of Borussia Dortmund's standing moved for a player of such immense midfield promise in 2015. In fact, such was Weigl's immediate impact with the Black-and-Yellows, he made over 50 appearances in his first season, reaching the DFB Cup final just days before making his senior debut with Germany in 2016. Dortmund's midfield metronome, Weigl holds the Bundesliga record for most touches of the ball in a single game (214). As we have already seen, 1860 is not only a cradle for formidable talent but also leadership. Current Leverkusen midfielder Baumgartlinger was the captain at Mainz before transferring to the BayArena and he currently wears the armband with the Austrian national team, for whom he played at EURO 2016. Developing his talents at 1860 from the age of 13, Baumgartlinger had a stint at Austria Vienna before making his way to the 05ers, where he scored twice in 124 league games prior to his switch to B04. Austria international Baumgartlinger spent five successful years at Mainz after leaving 1860, via Austria Vienna, before a move to Bayer Leverkusen in 2016. Leverkusen owe plenty of thanks to 1860 for the array of current stars on display at the BayArena that started out in the ranks of the Munich team. Volland was a resident of 1860's youth-team boarding school from 2007. A year later he was picked to play for Germany's U-17s, a feat he was honoured to repeat with the same age group at the 2009 World Cup in Africa. Then came a senior debut for 1860 against Augsburg in Bundesliga 2, and Volland's star has been rising ever since. At Hoffenheim - the club where he netted 33 times in 132 Bundesliga matches - Volland scored the Bundesliga's joint-quickest ever goal against Bayern Munich. A provider of assists as well as a goalscorer, Volland has earned ten senior caps with Germany to date. USMNT international forward Wood had Volland ahead of him in the junior pecking order at 1860 for a time but the Hawaii native - who arrived in Germany via California - eventually emerged from the shadows to make his own mark on the team he debuted for at senior level in 2011. Wood has battled through various injuries over the years yet a shining season at second-tier Union Berlin - where he scored 17 goals in 31 league games, the division's third-highest tally in 2015/16 - thrust him into the limelight. He subsequently made the move to current club Hamburg where he scored on his Bundesliga debut in a 1-1 draw against Ingolstadt in 2016.